In his long career, Daws has explored both his creative imagination and his unconscious mind, combining this exotic inner world with the magically serene external landscape of the Glasshouse Mountains. From 1944-49 Daws studied engineering and architecture at the School of Mines, Adelaide, attended the National Gallery School, Melbourne 1949-53 and between 1957-60 travelled and studied in Italy. He came to public attention as a member of Group 4 with fellow artists, Donald Laycock, Clifton Pugh and John Howley, exhibiting at the VAS Gallery in Melbourne in 1954. In 1970 Lawrence and his partner and later wife, the artist Edit Richards, moved from Adelaide to live on Bribie Island, off the Queensland coast near Caloundra. He recalled some years later how they would often have evening barbeques at Sunderland Beach from where they could see the Glasshouse Mountains. Right from the beginning the Mountains held him enthralled. A few months later, he and Edit bought the farm 'Owl Creek' at Beerwah, though they did not live there for another two years. By then Daws had found that the climate of Queensland - the moisture and the rapid growth that accompanied it - suited him. The house, set on a ridge, looks out over a valley of macadamia plantations and forest towards the extraordinary geological formations of the mountains which rise up in front. It is a mystical place. With their curious formations and dramatic projections, the Glasshouse Mountains lend themselves to a romantic sensibility. Almost immediately Daws felt that he had 'found his spot', a place where he felt at peace philosophically, emotionally and physically. In the mountains and rainforests of Queensland Daws found qualities which moved him at the deepest level. The luxuriant foliage and exotic plants had created an antipodean Garden of Eden and he discovered he could work at a pace which suited him without the noises and distractions of city life. He did not have to expend energy, as he himself had put it, 'neutralising' the background atmosphere in the way he did when in an urban environment, and he began to find a freedom and space he had not experienced before. Paradoxically, Daws turned inwards, to his own psyche, to express himself. Paradoxically, too, he tapped into the dark side of humanity so that all his canvases, whether they be of an interior scene or an external landscape carry the Daws' trademark expression of the enigmatic. Works such as ''Domestic Violence IV'' 1987 and ''The Bathroom II'' 1999. Always, the dominant atmosphere is that of strangeness and mystery. They are disquieting in a way that is difficult to explain. We are made decidedly uncomfortable without quite understanding why. It is a feeling that one senses without there being a rational or logical explanation, rather like the concept of the 'sixth sense'. It comes then as no surprise to find that Daws is well-versed in the work of psychiatrist Carl Jung, as well as Taoism, the I Ching (to which he was introduced by Patrick White) and the Tarot. The world of the collective unconscious, of archetypal dreams and fantasies not reliant on personal experience, of synchronicity, of the 'uncanny', inspire his works and are suitable companions to Daws' equally complex art works, many of which almost defy a simple interpretation. A fascination with often bizarre and surreal images, such as ''Big Pacific Eye'' 1972, came from the concept of the Heterotopic Eye - one which has been transferred anatomically to various parts of the body, such as the hands or wings - and is the spiritual equivalent of 'second sight'. These images remind the viewer of an all-encompassing, omnipresent Big Brother - a dominant watcher who sees all things - past, present and future. In ''Running Figures'' 1975, the viewer becomes the eye by being placed omnipotently up in the sky, hovering above the fleeing hordes. Are we God looking down on them, watching silently, while they fulfill their fate or are we some kind of gigantic alien from outer space, the frightening creature from which they flee? Perhaps rather than once again depicting sheer panic or the grimness of life, these images are actually about, as James Gleeson identified, our shared vulnerability. ''The Dark Sea'' paintings ''I'' and ''II'' and ''Night Sea Journey V'' refer to the Jungian concept of the 'dark night of the soul' - an immersion in the world of the unconscious. The sea is dark and menacing - an abyss of darkest indigo and, if we stay with it long enough, we begin to experience a feeling of entrapment. However, Jung stated that the 'night sea journey' is also about redemption. Healed by delving into the unconscious the ego attains self-realisation and the unconscious and conscious halves of the self work together in harmony and, through that process, are made whole. In ''Di Pasquale's Farm'' 1998 the plain and its man-made inclusions (dam, buildings, roads) weave a map of human endeavour, while the sky above (symbolic of the spiritual world) forms a narrow band at the very top of the canvas. 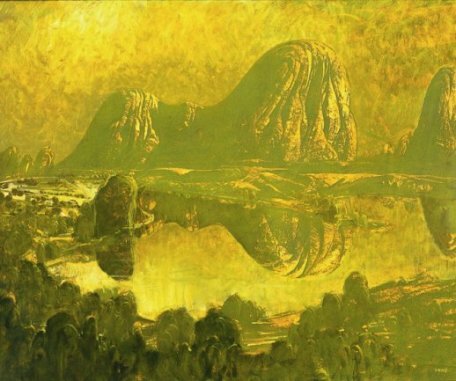 While in some paintings, such as ''The Black Lagoon II'' 1991, the Glasshouse Mountains are felt as 'ubiquitous presences', as Nancy Borlase once described them, in these late 1990s paintings they achieve mastery as metaphysical symbols. In the late 1950s and early '60s, Daws painted a series of paintings based on the ancient spiritual symbol of the Mandala. Daws had yet to read Jung and developed the works instead from an epiphanic moment he experienced while camping one night in the Tanami desert. 'Such things', wrote Sigmund Freud, 'cannot be thought up but must grow again from the forgotten depths'. The Mandala paintings are Daws at his most spiritual and form a bridge to his most recent work, a diptych of waterlilies which, like the mandalas are without any of the usual hints of menace. In this two-panelled work, redolent with colour and serenity, Daws perhaps has returned to an earlier spirituality, almost as if he had come full circle.